The dangers of obesity and its related diagnoses are well known. One of The Arc Baltimore’s newest programs, Healthy Weighs, is addressing that challenge for individuals from our Homeland and Loch Ridge centers. 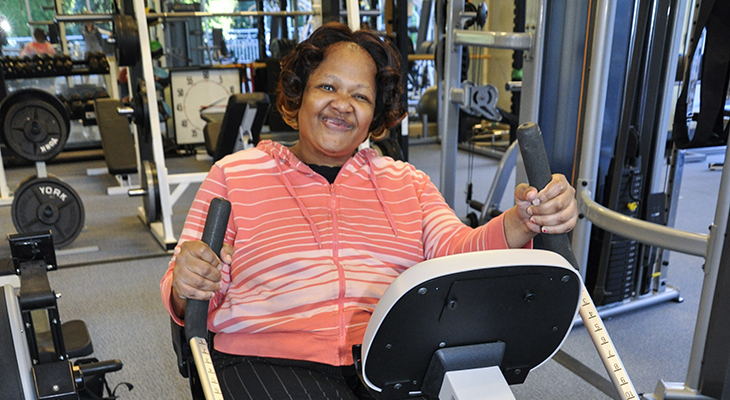 Carolyn Wyche enjoys using the recumbent elliptical at TU’s Wellness Center. The 10-week health and wellness program provides educational, medical, emotional and fitness support to help participants get and stay motivated. 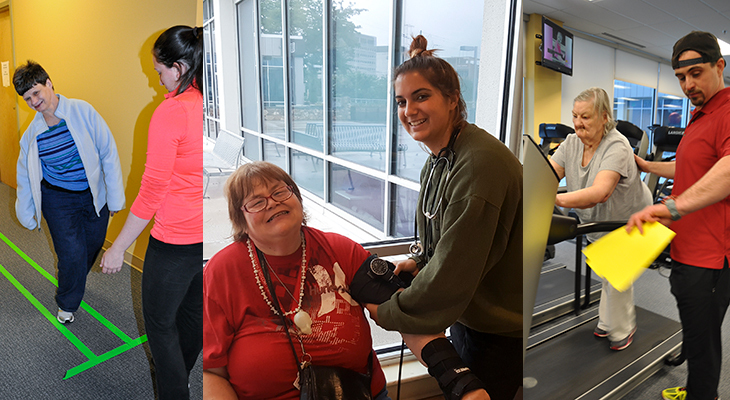 They meet each week at Towson University’s Wellness Center for an hour of physical activity and fitness instruction provided by student interns. Each participant receives an assessment and fitness plan created by a professor from the School of Kinesiology. It tracks improvement in flexibility, strength, balance and endurance. The team at TU also created a video with a dozen exercises participants can do at home throughout the week. Healthy menus and practical recipes are provided for house staff and residents to prepare. At TU’s Wellness Center, all Healthy Weighs participants receive individualized attention from student interns. The first group was very successful. Tracy Voelker lost 15 pounds! 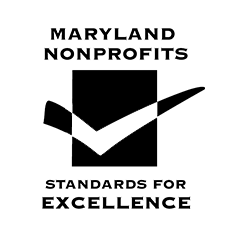 In addition to McGuire, Director of Nursing Florence Ndi, Director of Day Services Sly Bieler, and Assistant Executive Director of Community Living Aaron Atkinson oversee the program. Liz Moag, a board member whose sister is in our community living program, also is involved.